This is a lovely tasty way of doing pork. Serve with creamy mashed potato and savoy cabbage for a great meal. Heat the oil in a large deep frying pan and brown the chops for about 4-5 minutes each side, then transfer to a plate and set aside. Soften the onion and garlic in the same pan, then return the chops to the pan with any juices from the chops. Pour in the apple juice and bring to the boil, then simmer, uncovered, for 15 minutes, turning the chops halfway through. Transfer the chops to a plate again and add the apple wedges to the pan, stir in the creme fraiche, mustard and add a sprinkle of salt and pepper, then simmer to reduce and thicken the sauce until the apples are tender. Return the chops to the pan and simmer for another 5-10 minutes and sprinkle on the parsley, if using. This all-in-one parcel is a really easy way to cook and serve dinner. Pre heat oven to 200C/gas 6. Cut 2 large squares of kitchen foil, about 30cm by 30cm each. Boil the potatoes until just tender. Drain and halve or quarter, depending on size. Boil the veggies for 3 – 4 minutes, then drain. 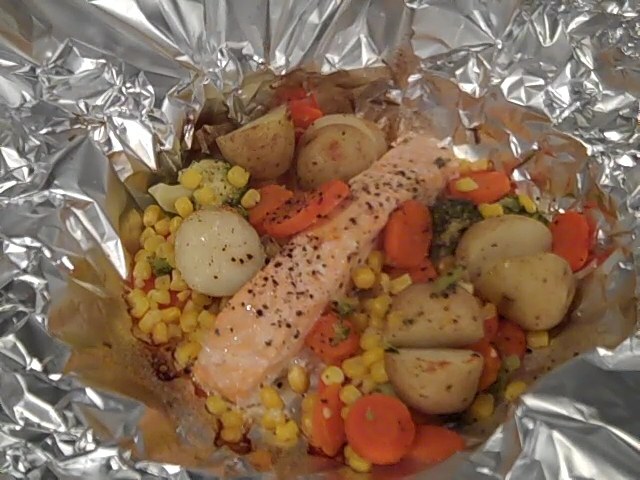 Divide the potatoes and veggies between the squares of foil. Put a piece of salmon on top. Add lemon zest and juice and a small knob of butter to each. Season to taste with black pepper. Wrap up the foil to make 2 parcels, leaving room inside for the air to circulate. Fold to seal the edges tightly. Put the parcels on a baking tray and cook in the oven for 20 minutes or until the salmon flakes easily.